This guide to radishes has all the information you need to know about spring radishes including a bunch of radish recipes to try out yourself! I’m starting to think this spring vegetable series is jinxing spring from actually coming. A week into March and it still feels like January over here. At this rate, the leaves on the trees might come out in June. Thankfully, we’re going to Florida in 3 weeks so I can forget about the misery that is NY this time of year for a good 6 days. Let’s dive into radishes with this week’s guide! I think radishes are a pretty under-appreciated vegetable. Many people think of them as sliced on top of a salad and that’s all they’re good for. Not the case as you can see from the recipes below. 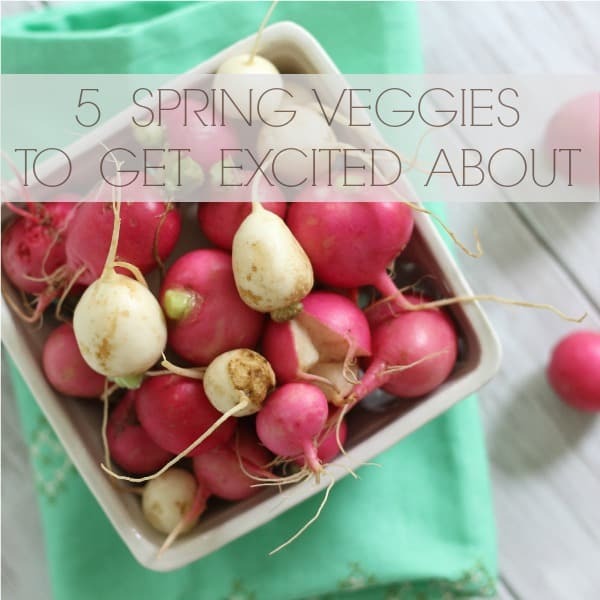 Here’s the scoop on these spring time root veggies. Radishes are in season from March through June. There are a TON of varieties of radishes but the most commonly seen one is the Cherry Belle with it’s red round bulb and white interior. The bulbs should be firm, not wrinkled or soft. Look for bunches with the leaves still attached as the greens are edible! Radishes will keep at room temperature for a few days. If refrigerated, they’ll usually last up to a month. The obvious and most common use is eating them raw after a quick wash. However, roasting them is my absolute favorite. They become almost potato-like and that very distinctive peppery bite diminishes quite a bit. Pickling is another option as well. And if you love pickled things don’t miss these pickled balsamic shiitake mushrooms, spicy pickled pineapple, pickled blueberries or how to make homemade pickles and how to ferment vegetables <– a pickled lovers dream! The radish greens can be treated like any other leafy green and used in a quick sauté to take full advantage of the plant. Much like carrot greens in this candied carrots recipe. Radishes have a ton of ascorbic acid, folic acid, potassium and a good dose of vitamin B6. 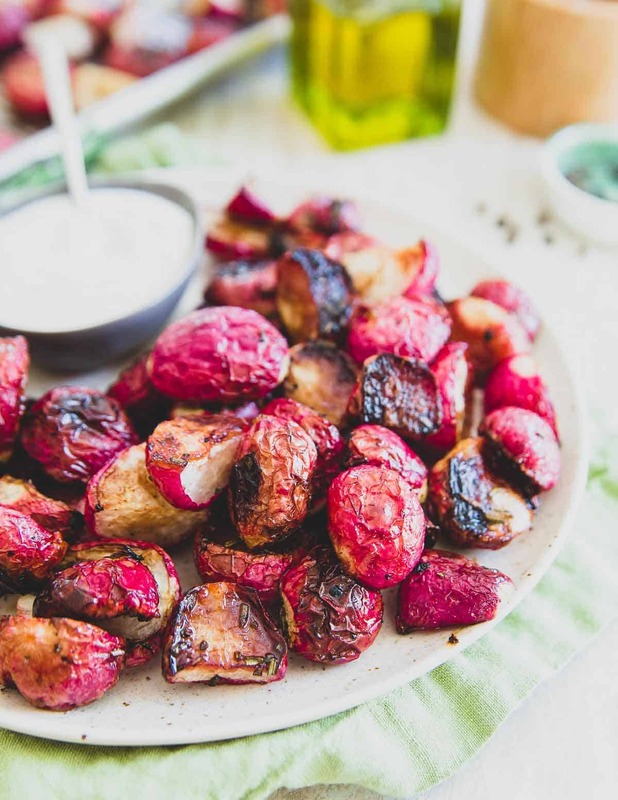 Oven Roasted Radishes with Rosemary & Honey – oven roasted radishes with rosemary and honey are a simple way to prepare radishes and mellow out their intense flavor. A great spring side dish! 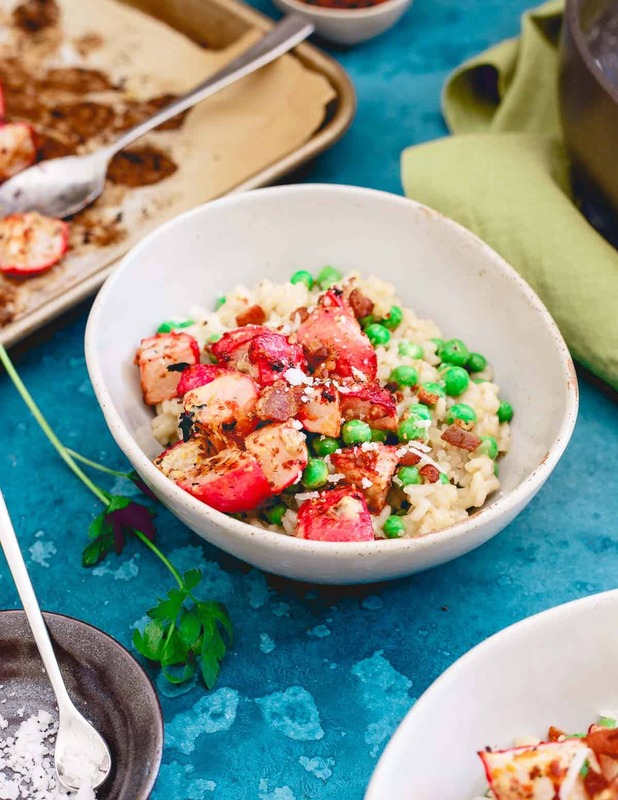 Spring Pea and Radish Risotto – Citrus infused creamy arborio rice is tossed with fresh spring peas and Meyer lemon dijon roasted radishes. Topped with crumbly bacon and freshly grated parmesan, this is pea and radish risotto is spring comfort food at its best! 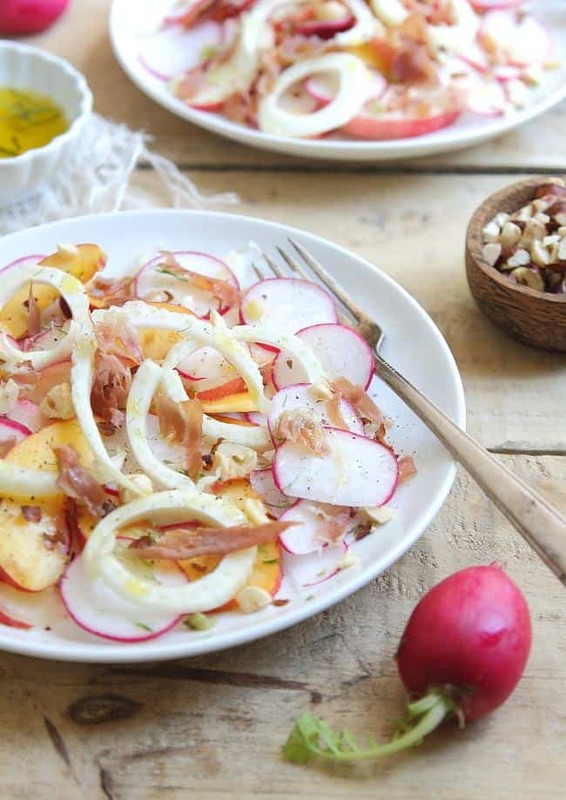 Peach and Radish Salad with Crispy Prosciutto – This peach and radish salad is topped with crispy prosciutto and toasted hazelnuts. It’s sweet and peppery with lots of fun texture in each bite. I was just thinking about radishes the other day…can’t wait for them to come back in season! Love this series, Gina! Keep the spring produce coming! So funny I do a door to door organics box subscription and just got radishes this week. They were so good and have me excited for spring!! I’m loving these posts, Gina! So informative and inspiring. Thank goodness spring is finally coming! I really do LOVE radishes, especially when roasted. I feel like they’re soooo underrated. This series awesome Gina, looking forward to all the veggie love. And thanks for sharing my Roasted Radishes with Fresh Chives + Roasted Root Vegetable Fajitas! Radishes are so underrated in my opinion! Thanks for sharing these recipes and including one of mine! Anyway, this post was really helpful! I will have to take it with me the next time I go to the farmer’s market. Ooooh, I have some radishes in the fridge right now, I used a couple as a topping for some flank steak tacos and was wondering what to do with the rest. I have never thought to roast them, I’m definitely doing to give it a try! Thanks!